This is a stunning and unforgettable aluminium and red Seder plate. 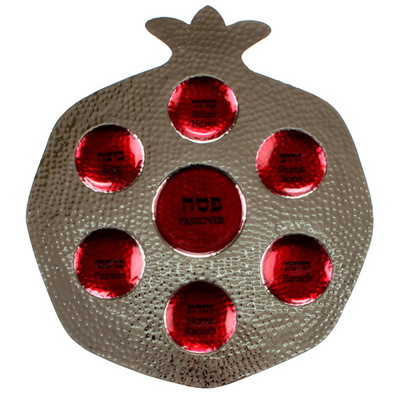 The six red display areas of the Seder tray are arrayed in a floral pattern. This artistic rendition creates a beautiful serving dish that will certainly accent any Passover table. This is a delightful aluminium and red Seder plate. The plate is silver with six red display areas for the placement of the traditional Passover foods. The pear shaped display areas are arranged in a floral pattern around a central point. Nestled in the center are the words Passover and Pesach, rendered in a tasteful font. The vibrant color and arrangement make a fantastic stand-out Judaica piece for any Passover ceremony. The middle of this Seder tray shows the word Passover written in both English and Hebrew. This thoughtful bilingual writing adds to the attraction of this unforgettable piece and emphasizes the modish look and feel of this Seder plate. The chic design and bold coloring make it a piece that will pop on a Passover table and allow it to become a valuable part of any family’s tradition.